Mockerkin Tarn is a cosy log cabin which stands in 18½ acres of beautiful private woodland, within just a few minutes walk of Loughrigg Tarn. 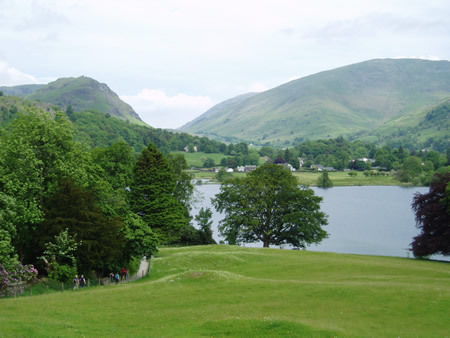 Nestling in an area of complete seclusion at the foot of Langdale valley, where some of the Lake District's most inviting hills and crags can be found, this is most certainly paradise for walkers, climbers, bikers or those who simply enjoy a stroll through some of the county's best landscapes. Mockerkin Tarn in an elevated position with parking for 2 vehicles. Extra vehicles can be parked in our main car park. The cabin has easy access for most active people, but may not be suitable to the elderly or infirm due to its hillside location. There is no wheelchair access to this cabin. Lounge with comfortable 3-seater leather sofa and chair, flatscreen TV/DVD, CD/Hi-fi and coal effect electric fire. Patio doors lead to veranda and garden area. Kitchen/Dining area is fully equipped with electric cooker, fridge, microwave, kettle, toaster etc. and dining table and chairs for four persons. Bedroom 1 has a double bed, fitted wardrobe, wall mounted heater and has double glazing. Bedroom 2 has single plus bunk beds and fitted wardrobe and wall mounted heater. Shower Room with shower cubicle/electric shower, W.C., Vanity Unit with shaver socket & light and heated towel rail. 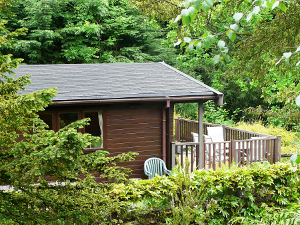 Outside there is a secure gated decked area with BBQ and comfortable garden furniture, plus hard-standing for two cars. This splendid 2 Bedroom cabin is now available which provides luxury accommodation for up to 5 people and is "dog friendly" (up to 2 well behaved dogs welcome). Visitors to Mockerkin Tarn also have free use of the Estate Leisure Facilities (open 1st March to 15th November) including family sized swimming pool with built in jacuzzi, seating area, table tennis area, sauna cabin (local fees apply) and changing rooms. The building also has a public payphone, communal laundry, and a small shop.